Over three in every four cases diagnosed in emergency departments are at an advanced stage. AROUND 3,000 CANCERS are diagnosed each year in hospital emergency departments, according to a new study from the Irish Cancer Society. 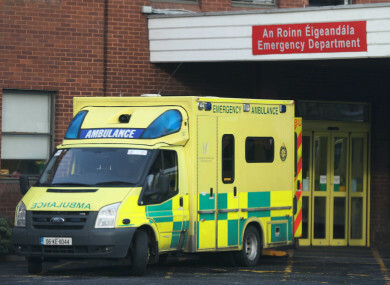 Donal Buggy, head of services and advocacy at the Irish Cancer Society said that the number of patients being diagnosed with cancer in emergency departments is worrying. He said that a total of 14% of cancers diagnosed in Ireland between 2010 and 2015 were emergency presentations through hospitals, and the overwhelming majority of these were at a late stage. Buggy added that by the time a patient arrives in an emergency department, they are probably not only presenting with acute symptoms but wracked with worry and fearful about what happens next. “Unfortunately, a late diagnosis often means fewer treatment options are available and a reduced chance of survival. Urgent steps need to be taken so people get diagnosed earlier,” he said. The research, funded by the Irish Cancer Society and carried out by the National Cancer Registry of Ireland, found that cancer patients from the most disadvantaged communities are 50% more likely to be diagnosed via emergency presentation than those from the most affluent communities. It also found that nearly three out of four cases involve patients over the age of 65, compared to just over half of elective cases, and that older patients are twice as likely to present as emergencies. Buggy said the research has highlighted “stark inequalities” in cancer diagnosis. “Unfortunately, if you are older or from a deprived area, you are far more likely to be diagnosed as an emergency, and there is a strong chance that your cancer is already at a late stage,” he said. “The National Cancer Strategy 2017 – 2026 aims to reduce the proportion of cancers diagnosed in emergency departments by 50% by 2026. If our actions are adopted, they will go some way to achieving this target and, ultimately, save lives,” he added. Email “Around 3,000 cancers diagnosed in hospital emergency departments every year”. Feedback on “Around 3,000 cancers diagnosed in hospital emergency departments every year”.